Please note that as always--unless otherwise specified--all these pictures are copyrighted by Karen McQuade, the OC Birder Girl. In raptors like hawks, eagles, and owls, the female is bigger than the male. Raptors grab prey with their feet. The word "raptor" comes from a Latin word meaning "to seize." If you want to see a wide variety of raptors, go to open country--especially in eastern Orange County. Other open areas to see raptors are large parks or wildlife areas like Seal Beach National Wildlife Refuge, Upper Newport Bay, Huntington Central Park, Bolsa Chica Ecological Reserve. On the latter, note that Huntington Central Park and Bolsa Chica are actually connected by open space which includes oil fields not currently open to the public. However, the birds--especially raptors--treat any area like this as one large, open area and move readily between any similar habitats. So even though a park may be small or moderate size, it depends on the larger area around it as to what raptors it may attract. Bald Eagles are considered rare in Orange County, but there are regular sightings in Fall and Winter. No nesting records. 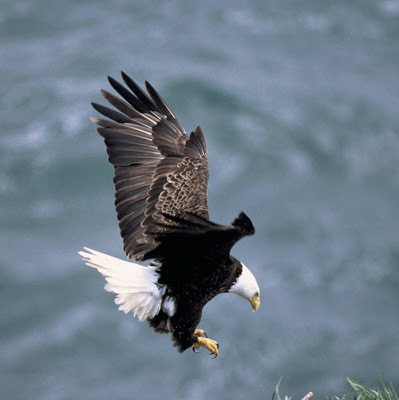 Mature Bald Eagles have a solid white head and tail, dark body and wing feathers and a large, yellow hooked beak. 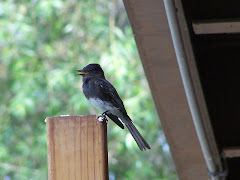 They are considered rare birds in Orange County, but are seen regularly over lakes, rivers, and other bodies of water. One wild, male Bald Eagle has visited a female Bald Eagle for three years in the fall or winter in the Orange County Zoo in Irvine Regional Park. Immature Bald Eagle has messy, white splotches rather than patches of white. Photo courtesy of US FWS. Photographer is listed only as Harrison. Unmistakable when mature, the immature Bald Eagle looks splotchy. Unlike the immature Golden Eagle which has neat patches of white, the immature Bald Eagle's white looks random and messy. Mature Bald Eagle courtesy of USFWS--Dave Menke photographer. Though Bald Eagles are rare, they have appeared regularly during fall and winter in Orange County in areas with open space, rivers, and lakes with fish. There have been occasional sightings at other times of the year. As you might expect, Bald Eagles are usually spotted near lakes and rivers. Bald Eagles have been seen in areas such as Irvine Regional Park, Peters Canyon Regional Park, Seal Beach at the Wildlife Refuge on the marine base, the old El Toro Marine Base now the Great Park, Irvine Lake, and other areas near or on the way to rivers or large lakes. 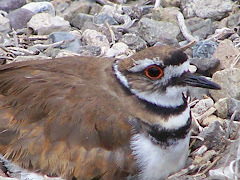 Although they nest in many counties around Orange County such as San Bernardino, Ventura, San Diego, and Riverside counties, there have been no recent nesting records actually in Orange County. Orange County Zoo in Irvine Regional Park. Rare, Golden Eagles are usually seen over open country in Orange County. They have been regularly seen in the east county area in the rural areas of the City of Orange, Irvine, and south Orange County areas in addition to rarer sightings in other parts of the county. The most frequent sightings reported over the years are at El Toro Marine Base aka now as the Great Park, in Mission Viejo, and at O'Neill Park. Note the that the cowlick of feather sticking out at the back of the head. This is common to all Golden Eagles. Immature Golden Eagle shows patches of white as opposed to the random white splotches of the immature bald eagle. Photo courtesy of US FWS. Photographer Donna Dewhurst. 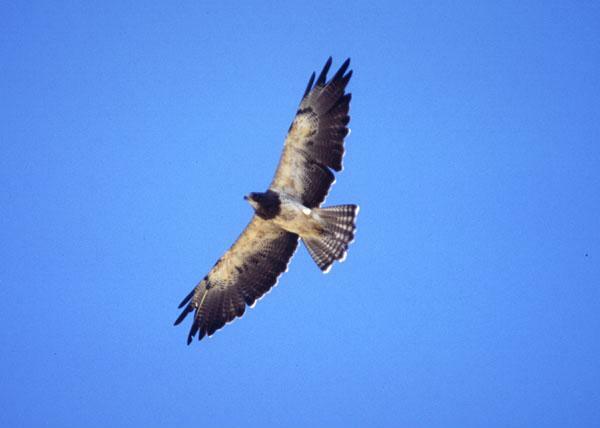 The immature Golden Eagle can be mistaken for a Bald Eagle with its white wing patches and white tail base. Note though that unlike the mature Bald Eagle, it has a terminal black band on its tail. It can also be mistaken for a California Condor by the inexperienced viewer. See details to consider when making an identification of a California Condor under the section regarding California Condors below. Mature Golden Eagle. Photo courtesy of US FWS. Photographer George Gentry. Buteos have long, broad wings and a short fanned tail which allow them to ride thermals up into the sky and soar for long periods of time with little to no flapping. They ride the wind and watch the ground for tasty prey. Extremely common in Orange County. It seems like every park or freeway off ramp has one perched on a tree or street light. Nests in Orange County. I took this shot at the lake without the island at Mile Square Regional Park just about an hour before sunset. This Red-tailed Hawk had just killed a duck. Red-tailed Hawks are very strong. It actually grabbed the duck in its talons and flew off with it. 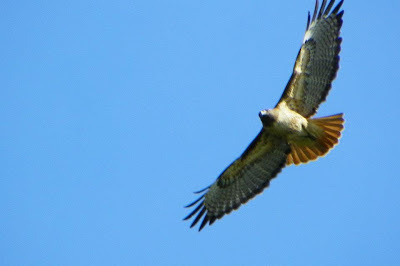 Its red tail is barely visible here--hidden under the long wings. 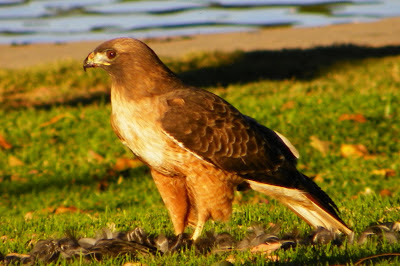 Red-tailed Hawks have many morphs. The Red-tails here are the most common Orange County variations. 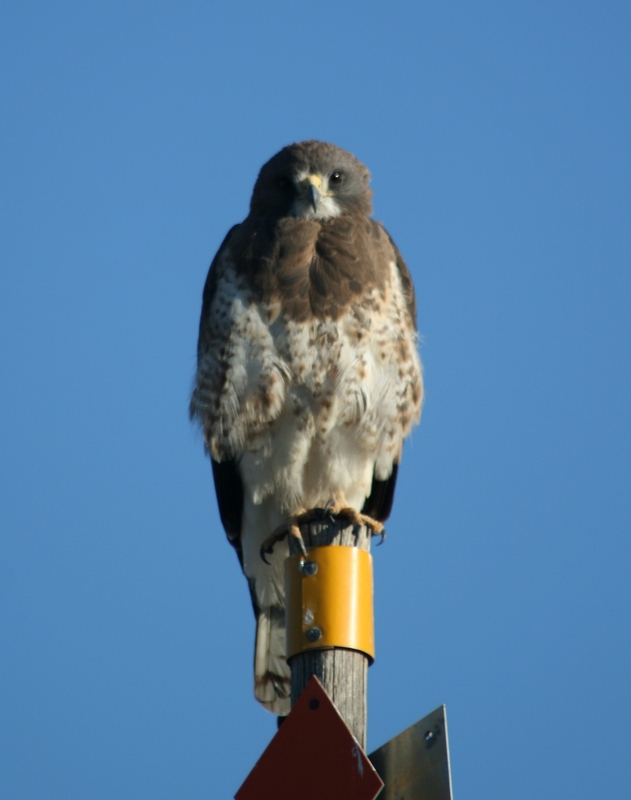 For other morphs check my post Red-tailed Hawk Morphs. Occasional sightings in Orange County in the fall and winter. Broad-winged Hawk from Wikipedia. Photographer Julie Waters 2007. Rough-legged Hawk courtesy of Wikicommons Walter Siegmund, photographer. Rough-legged Hawk courtesy of Wikicommons. Photographer Dominic Sherony. This is a photograph I snapped during a bird show at the San Diego Wild Animal Park. Rare in Orange County. Note rufous shoulders, and tail with white base, black stripe, and terminal white band. Harris's Hawk courtesy of Wikicommons. Alan Vernon, photographer. 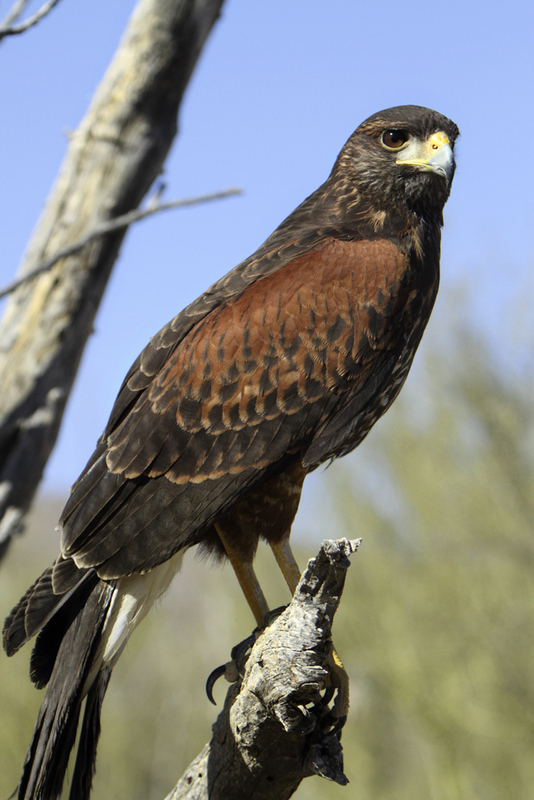 Note that Harris's Hawks travel in pairs or groups, and often hunt together. National Geographic calls them "the wolf pack of the air." Harris's Hawk courtesy of Wikicommons. Photographer Tony Hisgett. And this one by National Geographic as well. 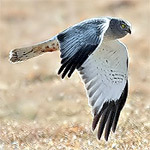 Zone-tailed hawk courtesy of US FWS. Gary M. Stolz photographer. Uncommon, but regular sightings in open areas and over regional parks. Zone-tailed Hawk courtesy of Wikicommons. Photographer Dominic Sherony. Uncommon, but regular sightings in open areas and over parks. Ferruginous Hawk photograph which I snapped during a show at San Diego Wild Animal Park. Ferruginous Hawk Courtesy of USFWS No photographer listed. Ferruginous Hawk Courtesy of Wikicommons. Photographer Alan Vernon. Cropped by Wikicommons user from Alan's original. Rare, but is seen in Orange County singly and in groups usually during migration. Swainson's Hawk courtesy US Fish and Wildlife Service. Photographer not identified. Swainson's Hawk courtesy of Wikicommons. Photographer Megan McCarty. Swainson's Hawk courtesy of Wikicommons. Photographer Bureau of Land Management employee. Fairly common in Orange County in wooded areas such as Santiago Oaks, Irvine Regional Park, and Huntington Central Park. Nests in Orange County. Red-shouldered Hawk. Photo courtesy of US FWS. Photographer not listed. Red-shouldered Hawk I snapped in Crestline. 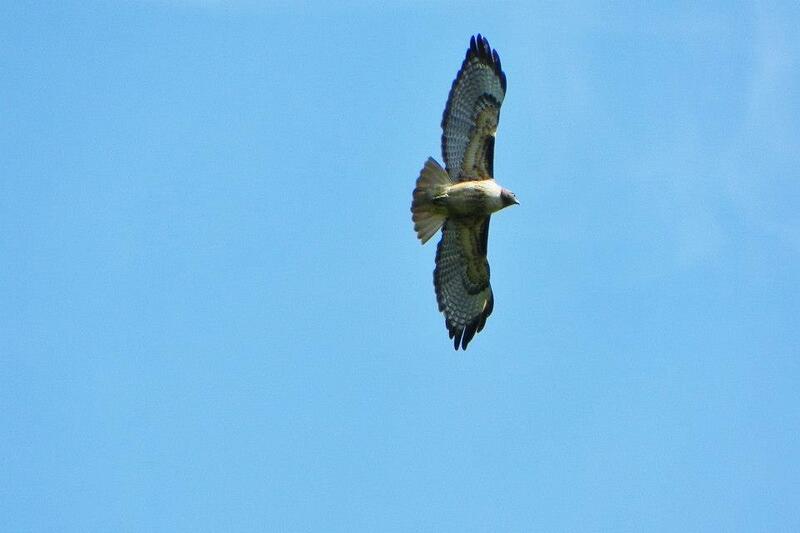 Same Hawk, spotted wings showing. The thick stripes on the wings show up as spots when the wings are folded. Stuffed Red-shouldered Hawk at Irvine Regional Park Nature Center shows stripes in partially extended wings. Although a blurry shot, you still can see the broad, black-and-white stripes in the tail and the wings and the rufous breast. No thin barring like the Cooper's Hawk, but bold, thick stripes. Taken at Irvine Regional Park. 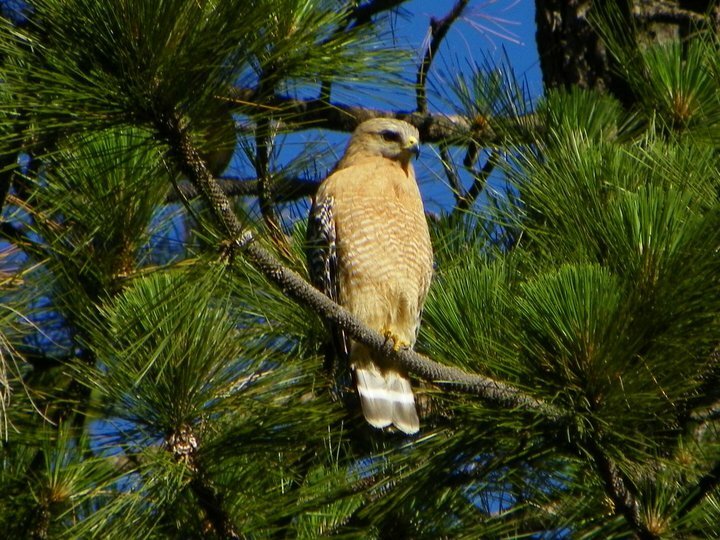 Red-shouldered Hawks, though Buteos, are hawks of the forest and oak woodlands. They are also one of the noisiest hawks we have. I usually hear them before I see them. They are reddish brown with a thickly striped black and white tail and wings. With wings folded as they perch, they have rusty shoulders and spotted wings. You can see them in parks with lots of trees like O'Neil Regional Park, Irvine Regional Park, Huntington Central Park, Santiago Oaks Regional Park, and others. Sometimes called the "fish hawk," Osprey live almost exclusively on fish, but do on rare occasions eat smaller birds, lizards, or amphibians. Very common in Orange County. Even stocked ponds and small lakes in Orange County city parks get a bit of attention from Osprey. 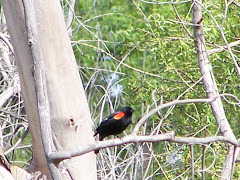 Several nesting pairs in Orange County. 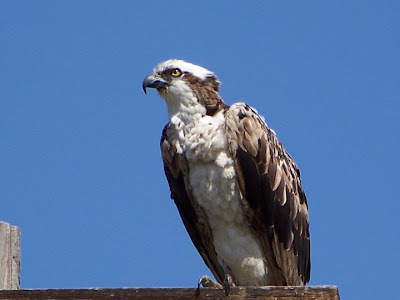 One of two nesting Osprey at San Joaquin Wildlife Sanctuary. Osprey at Tewinkle Park a few years ago. They often take advantage of small lakes at Orange County parks such as Tewinkle Park, Huntington Central Park, Mile-square Regional Park, Carr Park, and other parks with fish in their relatively small lakes. They can also be seen at wetlands and along Pacific Coast Highway where they have a choice between the ocean and several wetlands. Osprey eating fish on electrical post at Upper Newport Bay. I took this picture at Mile Square Regional Park. Notice that there is a bend in the wrist of the wing. This is a good field mark for identifying Osprey. Again, from Mile Square Regional Park. Notice the bend in the wing. Uncommon, but regularly seen in Fall and Winter in Orange County in areas near water such as Bolsa Chica Ecological Reserve, Upper Newport Bay, and Crystal Cove. 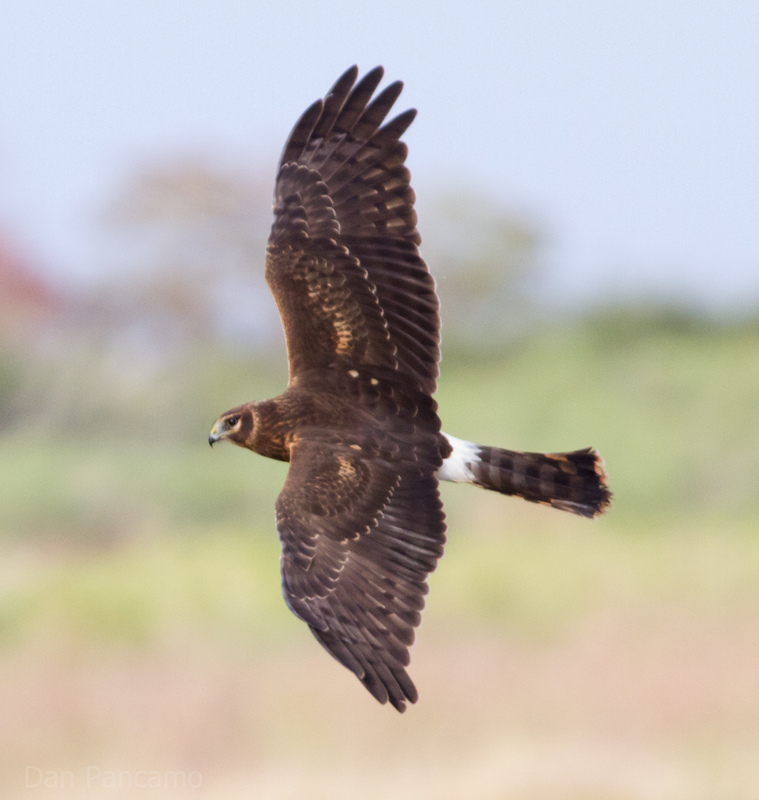 The Northern Harrier female is brown with a white spot on the rump. This female Norther Harrier above sits out in the marsh at Upper Newport Bay. 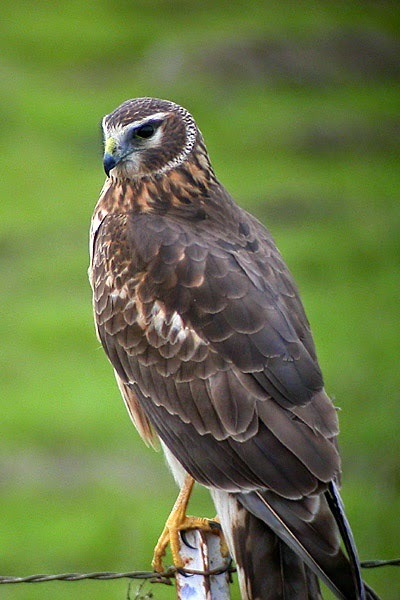 The Northern Harrier commonly sits on the ground to eat or rest. The male is gray and white with a white spot on the rump. Northern Harrier female. Wikicommons. Photographer Len Blumin. Male Northern Harrier flying low over the wetlands at Upper Newport Bay. Male Northern Harrier flying above Fairview Park in Costa Mesa. Male Northern Harrier courtesy of Wikicommons. Photographer unknown. From National Park Service. Juvenile Northern Harrier courtesy of Wikicommons. From the California Park Service. Northern Harrier female. The white at the base of the tail is an easy field mark to spot in either male or female. Courtesy of Wikicommons. Photographer Dan Pancamo. 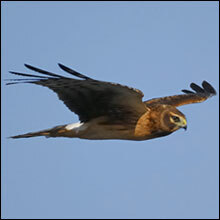 The Northern Harrier is often first seen hunting over a marsh or wetlands or near the ocean. The white spot at the base of the tail is the most obvious field marking. The female is brown and the male is gray. They have round disks on their faces that are very like an owl with the same purpose--to direct sound to their ears. They hunt by sound and by sight. Their long legs hang down as they fly. Regularly seen year round, uncommon, but sightings are increasing. Nests in Orange County, but nesting numbers went down for a few years. Seems to be recovering slowly. Seen at Bolsa Chica Ecological Reserve, Santiago Oaks Regional Park, San Joaquin Wildlife Sanctuary, Huntington Central Park, Mason Regional Park, and Orange County regional parks, open areas, the Santa Ana River, and freeway off ramps. Nests in Orange County. White-tailed Kite hovering over parking lot at Bolsa Chica Ecological Reserve. Seen in the open country, but also in parks and by freeways exits and entrances. This is a common hunting method for White-tailed Kites. White-tailed Kite at rest. You can see that it is not all white, but has black shoulders and gray wings, and red eyes. Photo Courtesy of US FWS. Photographer Robert Burton. 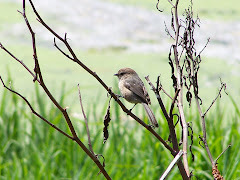 Uncommon in Orange County, but there are some regular sightings at Bolsa Chica Ecological Reserve, San Joaquin Wildlife Sanctuary, and some of the regional parks in the area. Courtesy Wikicommons. Listed as from US FWS Karen Laubenstein, photographer. Uncommon in Orange County as a whole, but may be seen regularly in certain spots like Bolsa Chica Ecological Reserve and regional parks, the Santa Ana River and other areas. Photo courtesy of US FWS. Photographer Craig Koppie. Photo courtesy of US FWS. Photographer not listed. Photo courtesy of US FWS. Photographer Bill Buchanan. Fairly common in certain areas. Nests in Orange County. Male American Kestrel up on the mesa in Bolsa Chica Ecological Reserve looking for a meal. Male American Kestrel striking a pose. American Kestrels are tiny hawks that eat insects, lizards, small mammals, and birds. Here, a male eats a large insect in a tree on the Bolsa Chica Ecological Reserve mesa. Colors really showing on a male American Kestrel . Photo courtesy of US FWS. Photographer unknown. The female American Kestrel is browner without the slate-blue wings and cap and does not have a bright rufous tail like the male. They tend to hover in flight looking for prey. It is not uncommon for them to be perched on a dry branch scanning the ground for prey. This one looks down from the mesa at Bolsa Chica Ecological Reserve. You will also see them at San Joaquin Wildlife Sanctuary, Upper Newport Bay, Santiago Oaks Regional Park, and many other locations. 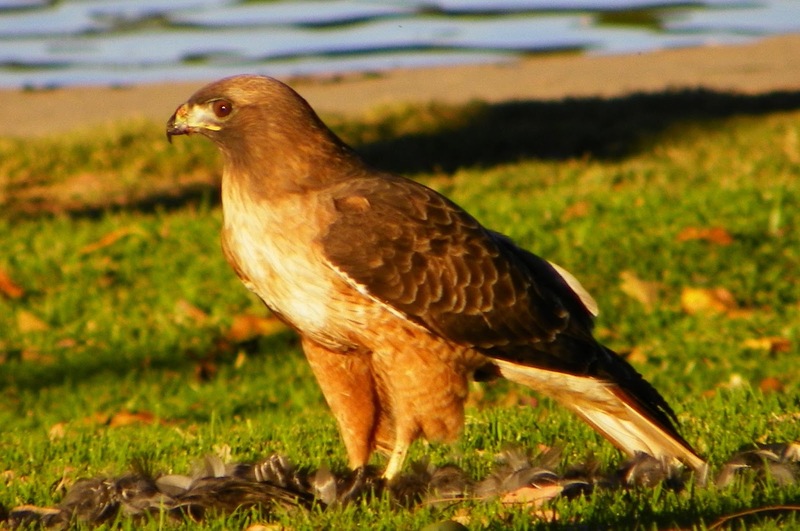 I saw one in Cypress, CA swooping down onto a lawn in a business area, and in a residential area in Costa Mesa. Unlike buteos, accipiters do not soar, but instead zip among trees in the forests and woodlands and neighborhood foliage in pursuit of prey. These hawks are built for maneuverability and speed. 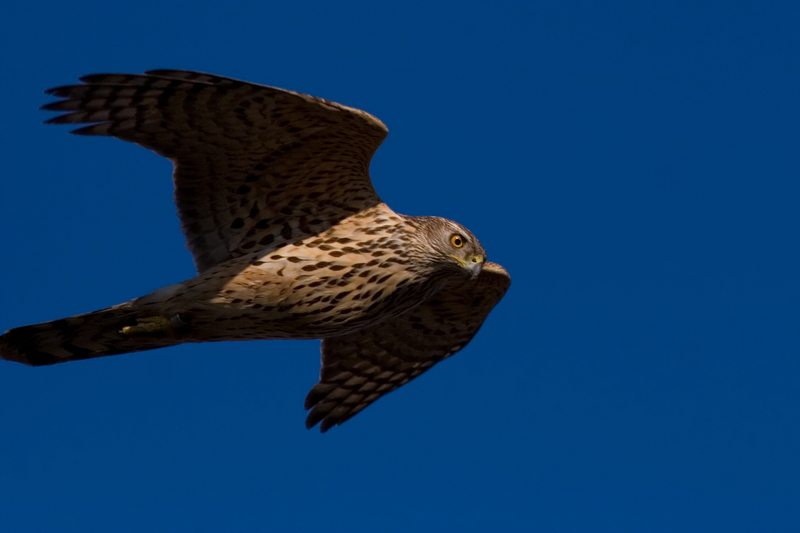 I recently was walking down a path at Mile Square Regional Park Nature Center when an accipiter came barrelling down the narrow, shrub-lined path about two and a half feet off the ground. It quickly swerved around me and sped down the narrow trail. The first two accipiters listed here are are almost impossible to tell apart because even though the female Cooper's Hawk is bigger than the female Sharp-shinned, the smaller male Cooper's Hawk and the female Sharp-shinned are much closer in size. Both mature Cooper's and Sharpies have slate gray heads and red eyes. The Sharpie has skinny little legs compared to the bigger, thicker legs of the Cooper's. Like all Accipiters, they have short, rounded wings and long tails. 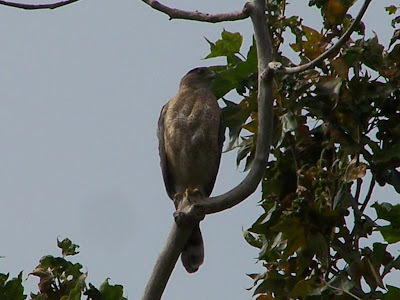 The Cooper's Hawk is very common in Orange County year round. Nests in Orange County. Adult Cooper's Hawk seated in the trees above the ducks and coots at Huntington Central Park near the old Alice's Breakfast in the Park. 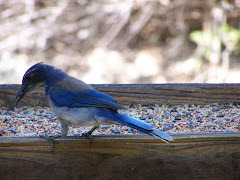 He was selecting his or her own breakfast. Mother Cooper's Hawk watching over her rather partly downy covered fledglings. The smaller Dad was not far away. Cooper's Hawk finishing off an oriole at Morongo. Juvenile Cooper's Hawk by the Huntington Central Park Library garden. Notice the rounded, long barred tail and the wide white tip at the end. Juvenile Cooper's Hawk snapped by me in the fenced garden behind the Huntington Central Park. Notice the eyes have not yet turned red like the adult Cooper's Hawk. Juvenile Cooper's Hawk courtesy of US FWS no photographer listed. 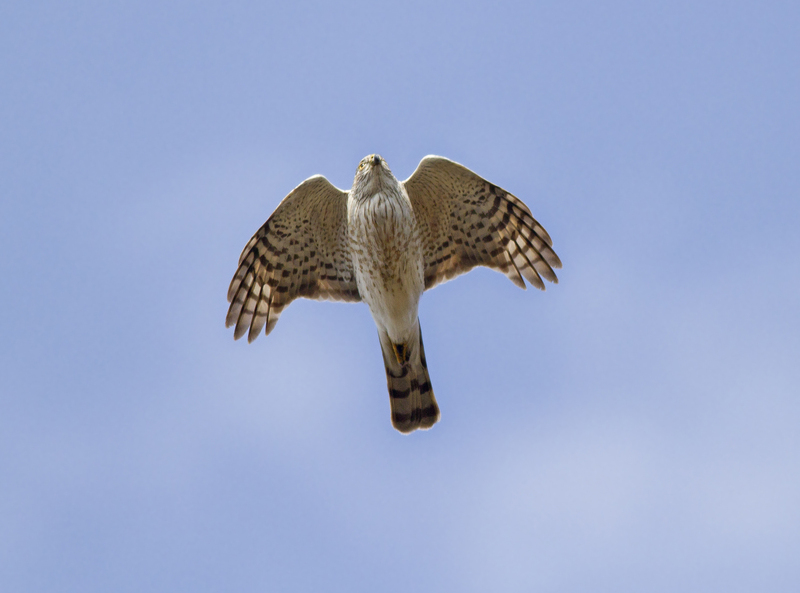 To tell the difference between Cooper's Hawks and Sharp-shinned Hawks, check out this excellent link from Cornell Lab of Ornithology's FeederWatch pages Identifying Cooper's and Sharp-shinned Hawks. Uncommon. 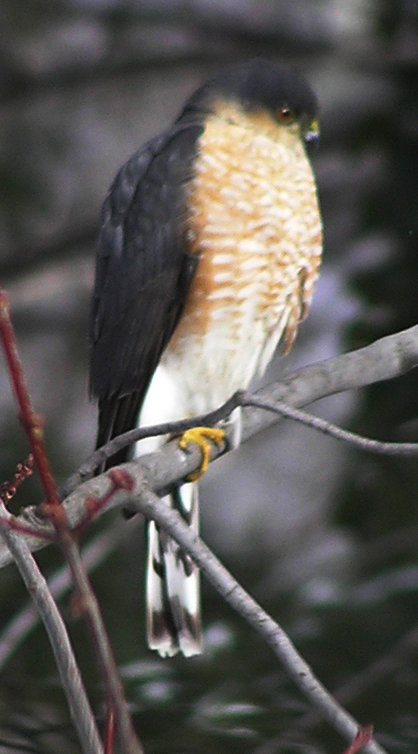 Very similar to a Cooper's Hawk, but smaller. However, the male Cooper's Hawk and the female Sharp-Shinned may be a bit closer in size. 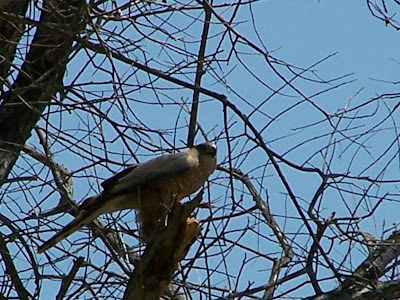 The Sharp-shinned has very skinny, frail-looking legs compared to the more substantial legs of the Cooper's Hawk. The Sharpie's tail has square corners and a thin white tip while the Cooper's has round corners and a thick white tip. 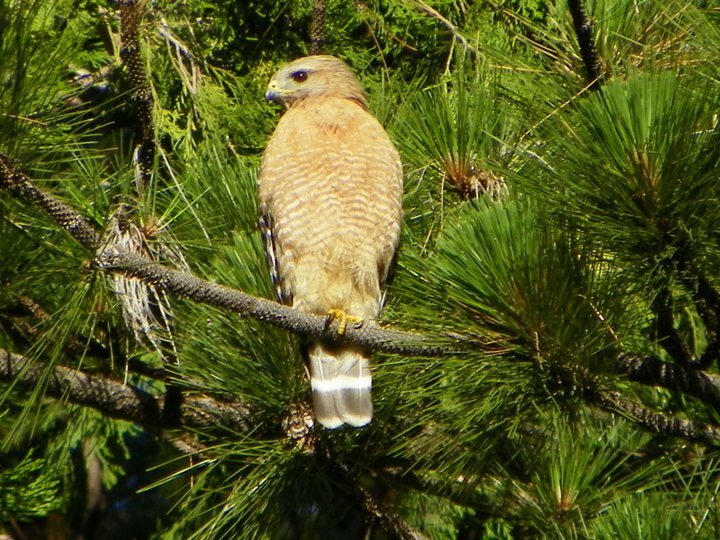 To tell the difference between Cooper's Hawks and Sharp-shinned Hawks, check out this excellent link from Cornell Lab of Ornithology's FeederWatch pages Identifying Cooper's and Sharp-shinned Hawks. Sharp-shinned Hawk courtesy of US FWS. Donna Dewhurst Photographer. Juvenile Sharp-shinned Hawk courtesy of Wikicommons. Steve Bernardi, Photographer. Sharp-shinned Hawk courtesy of Wikicommons. H. Petruschke, Photographer. Juvenile Sharp-shinned Hawk courtesy of Wikicommons. Kevin Cole, Photographer. Northern Goshawk courtesty of Wikicommons. Photographer Norbert Kenntner. Juvenile Northern Goshawk courtesty of Wikicommons. Source listed as Thermos. 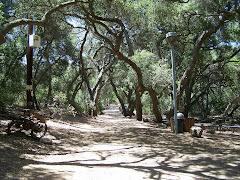 See my post The Owls of Orange County. Turkey Vulture in flight with classic two-toned wings. The trailing edge of their wings is very light gray or white. They have a large wingspan. They have a bare, red head. Turkey Vulture cooling off at the Orange County Zoo in Irvine Regional Park. Turkey Vulture in cage at the Orange County Zoo Irvine Regional Park. Turkey Vultures are very common in Orange County soaring over the parks, wilderness areas, open spaces, and freeways. They are pretty much everywhere ready to clean up the county of dead animals. Endangered and rare, California Condors have not had any verified sightings in Orange County, but there have been a two very recent unverified claims to have seen California Condors in Seal Beach and Costa Mesa, and so I am including them for assistance in differentiating the California Condor from other similar birds in Orange County. California Condor stretches its wings in its cage at the San Diego Wild Animal Park. Unlike the Turkey Vulture who has a skinny, red head, the California Condor had a multicolored, puffy head. Also unlike the Turkey Vulture, there is a patch of white toward the leading edge of the wings. Close-up of the puffy multicolored head. Mature California Condor in flight. The white is on the leading edge of the wing near the body. The tail is dark. Photo courtesy of Wikicommons. Photographer Phil Armitage. Here is his website http://www.philarmitage.net/zion.html. Compare with the immature Golden Eagle which shows patches of white further back on the wing and away from the body. The white tail has a terminal black band. Notice also the difference in the color, shape and size of the head. Photo courtesy of US FWS. Photographer Donna Dewhurst. Turkey Vulture in flight. Note the extremely small head. The primaries and secondaries of a Turkey Vulture's wing are grayish white. The tail is dark. Photo courtesy of Wikicommons. Photographer Dori. Altered by Snowman Radio. 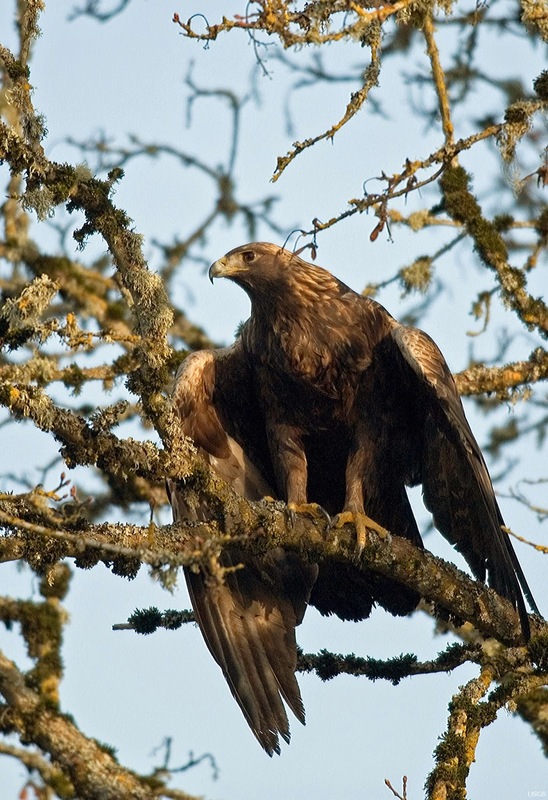 Please note that the Golden Eagle is smaller and has a large, dark head, and a white tail with a terminal black band. The Bald Eagle is also smaller, and has a larger white head and a white tail. The smaller Turkey Vulture is dark with a smaller black or red head and two-toned wings seen from below--not patches. The trailing half of a Turkey Vulture's wing is grayish white as opposed to the California Condor's clean, white patch in the leading area of the wing near the body. So pay attention to color and where on the wing the light color is and size. Also note that the California Condor is much larger than the Turkey Vulture. The California Condor's wingspan is about 9.8 feet as compared to the smaller wingspan of the Turkey Vulture which is 5-6 feet. A California Condor will look huge and almost certainly will be tagged because they are endangered and very closely monitored. However, remember a large vulture with a tag could also be a Turkey Vulture. Turkey Vulture populations are being monitored by tagging them as well. So that should not be a deciding factor. A tagged vulture could be either, but an untagged California Condor should be carefully observed, and the details noted to verify your sighting because an untagged condor would be extremely unlikely. Take pictures of any California Condor sighting if you can. Make notations as to the location and time. Since there are no verifiied sightings in Orange County, California, your sighting will be looked at with skepticism until verified.